I've been obsessed with nails for as long as I can remember. But my obsession doesn't even come close to that of Scrangie! Her swatches are amazing, her breadth of nail and polish knowledge is out of this world. Read on to discover how she first became interested in nails, how she felt about the polish she got to design with Rescue Beauty Lounge, and so much more! I'm just a regular girl from the Midwest! I'm married, no children, I love music, animals, nature, reading, cooking and playing video games. Not the most exciting profile, I'm sure, but that's who I am! How did you first become interested in nails? I've been interested in nails for as long as I can remember. I always played with my mom's nail polishes as a little girl, and I even had my very own bottle of some type of peel-off pink nail polish (may have been Tinkerbell?) that I got in all sorts of trouble with. I almost always had my nails painted ever since I could do them on my own and growing up I had a pretty large stash of polish. I really liked all of the fun iridescent colors, neons and olive green shades that were around back then. I can't really think of a time in my life when I haven't been interested in nails! I've always been really obsessed with makeup and beauty products and I really wanted a place where I could talk about the things that interested me. No one I knew in real life really seemed to want to hear me yap about makeup all the time, so I made a blog where I could write down my thoughts on beauty. So many awesome highlights, I don't even know where to begin. I've met so many cool and interesting people through my blog. I've made friends with other beauty junkies from all over the world. It's been really amazing to talk to people so far away from me yet so interested in the same things! Places as far away as Sweden, Finland, Australia, Japan, Israel -- definitely an opportunity I wouldn't have gotten without my blog. I've also really loved being able to meet some of the people behind the polish brands. It really opened my eyes to see that there are actual individuals behind those bottles of polish, not just a nameless, faceless corporation. It's so exciting to think that the people who make the polish I love actually read my blog. I can't even describe it. They're like rock stars to me! 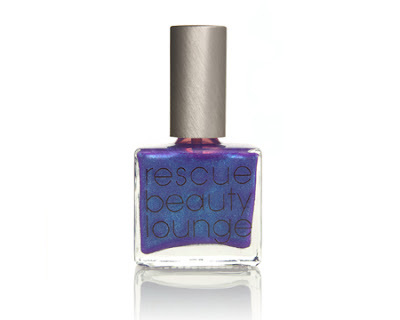 Another major highlight is of course the chance I got to design a polish with Rescue Beauty Lounge. It was like a dream come true. Such a high honor and I feel very privileged and thankful to have received such an amazing gift. What are your top 5 nail essentials? 1) Absolute must-have is quick dry topcoat. I'm a big fan of Seche Vite, but lately I'm branching out into other brands and so far I'm really liking Orly In A Snap and Nubar Diamont Seal & Shine. I can't imagine having to do a manicure without quick dry topcoat. It's changed my life. 2) Cuticle oil. 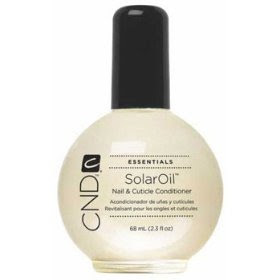 Out of all the brands I've tried, Creative Nail Design Solar Oil is my absolute favorite. I carry it with me everywhere I go and I have bottles in every room of my house. 3) A good nail treatment. 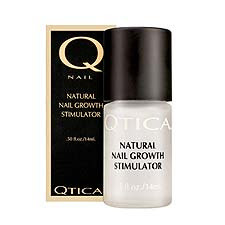 My "holy grail" treatment is Qtica Natural Nail Growth Stimulator. I never wear just plain base coat -- seems useless. 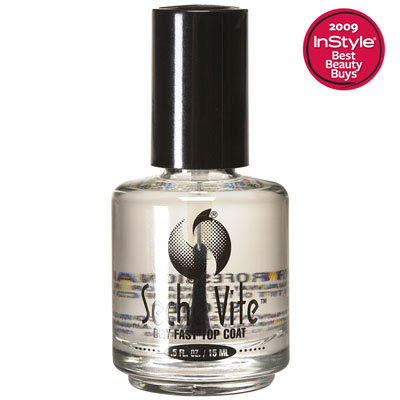 I always use a treatment as my base coat -- why not have my base coat benefit my nails as well? 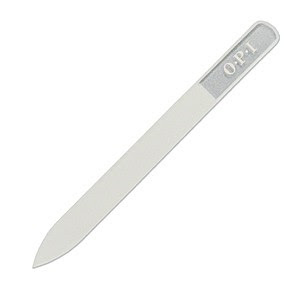 4) A glass or crystal file. It leaves smooth edges, no snags! It lasts forever and it can easily be sterilized. My favorite is OPI's, but Essie is a very close second. 5) A nail brush. Such a simple and cheap item, but it is really essential. I use it almost every time I wash my hands -- I don't want anything funny under my nails! And they're so inexpensive that you can use a new one every week to keep things sanitary. 1) Never use your nails as tools! It takes a little bit of effort to remember not to use your nails as tools, but it will really improve your nails. The less they bend and flex, the less they'll split and break. 2) Always wear gloves when you have your hands in water for an extended amount of time and never ever bend your nails while they're wet. If I bend my nails when they're wet, it's almost inevitable that they'll break. 3) Moisturize constantly. Lotion, oil, cuticle cream, whichever you have and like. It keeps the nails healthy and resilient ant improves the appearance of your cuticles. What polishes and brands can you simply not live without? I always need my go-to polishes. A good purple, a good green and a good silver foil or silver holo. I'm very fond of China Glaze Sexagon, OPI Ink, Illamasqua Rampage, Zoya Trixie, Barielle Date Night, Rescue Beauty Lounge Recycle and Savvy Deep Amethyst. I'm also quite the OPI fan when I need something fast and reliable. The colors aren't always consistent between batches, but I know I can always count on them to apply easily and dry quickly. I've really grown fond of the Pro-Wide brush, it makes the painting process so much faster for me. I also can't live without holos, glitters and vampy colors. I love a good neon. I love dark shimmery blackened shades, duochromes or other "interesting," non-traditional shades. I guess I can't live without cool polish! I really love her blog. She makes so nice pictures!